Every year, smartphones get smarter. They get faster processors, more pixels, clearer audio, more accurate location services, ultra high-res cameras, and a thousand other “improvements” (is Apple’s new emoji keyboard really an improvement?). And yet for all the improvements in smartphones, battery life is still an ongoing problem. According to Tom’s Guide, the average battery life of a smartphone is about 8 hours of continuous web surfing. Of course, once you start using battery vampires like GPS or an excessively taxing Facebook app, your battery life is much shorter. The end result is having your smartphone die at the worst times, like when you run out of gas in the middle of the North Dakota wilderness. Companies like Mophie make it possible to extend battery life through pre-charged external battery cases, but no one has truly solved the problem. For devices that are so mind-bogglingly smart, the constant charging that’s required seems painfully outdated. Why hasn’t anyone built a better phone battery? A new company called “Ampy” hasn’t exactly solved the battery problem, but they are taking a unique and healthy swing at making sure you can charge your smartphone at all times. And people are taking notice; previously only raising funds through competitions and a Kickstarter campaign, the team of six in Illinois just raised $875k in a seed round of funding. The “Ampy Move” is the “world’s first wearable motion charger”. The device captures a user’s kinetic energy (energy generated by moving), and then converts that energy into power which is stored in an internal battery. That power can then be used to charge a smartphone. We set out to solve a problem that a lot of us have: Your smartphone dies before the end of your day. We were all active people, so we thought, is there a way to capture the kinetic energy that we put into daily activities to charge our phones? I run all the time, which makes the device ideal for a person like me. The form fitting design makes it easy to strap to the arm or leg in the same way a smartphone is normally strapped on. According to their website, an hour of exercise can produce approximately 1 hour of smartphone battery life. The Ampy Move can also collect power when it’s stored in a pocket or bag, or even strapped to a pet. As long as movement is involved, the Ampy Move can create power. The company also offers a free “Ampy+” smartphone app, which predicts battery life and serves as a fitness tracker. Friends can also compete against each other to see who can generate the most power. 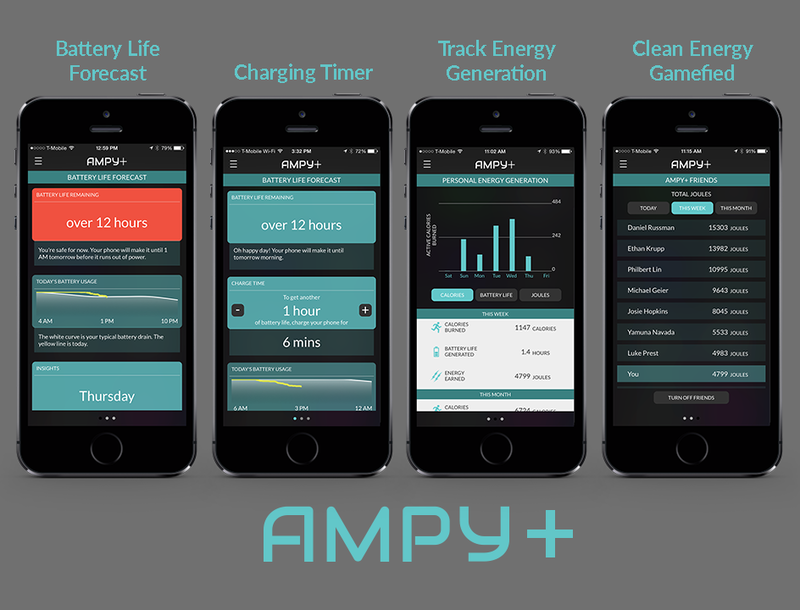 Ampy is the perfect product for active people who don’t have frequent access to smartphone chargers. But is this market growing or shrinking? Car vibrations don’t create enough movement to generate power, making the Ampy Move somewhat irrelevant for those who commute to work, sit at a desk all day, and then drive home. Ampy is probably a better fit for urban dwellers who spend significant amounts of time walking around the city, or for people with very active jobs. Whether Ampy can generate sufficient revenue from that market base remains to be seen. Perhaps the future of the company doesn’t lie in the Ampy Move, but in licensing their hardware to wearable manufacturers. Wearables are clearly an exploding market and have the same battery issues that smartphones do. A kinetic charger that could be built directly into a wearable has enormous potential. If you read user reviews on Ampy’s kickstarter page you will see that nearly every review is negative. Users are complaining that the charge generated via movement is not efficient at all and completely unusable. Ampy is even telling users to “pre-charge” their batteries first via the wall. They are just THAT shameless. Some users have ran miles and miles (20 miles +) with barely any charge generated. This is not just one user, but nearly EVERY user that has posted feedback on their comments page. So this begs the question, is this an objective article or just a shill piece for a scam? Turning simple movement into useable power is great. Just walking and going up stairs is movement. I don’t think you have to be an athlete to use this device. And think of all the possible applications, starting with military personnel operating in the field, and hikers and campers far from power outlets. That is a great idea, but the power generated needs to be actually useful (meaning enough is generated through a reasonable amount of effort). Unfortunately from all the early reviews this device doesn’t seem to live up to its hype. What a shame. It is nice to see new technology coming out each year, but I have had enough of ways to charge my phone. If you cannot get through an entire day with your smartphone battery, you are spending way too much time on it. What is wrong with charging it like everyone else?